Arunima Sinha recently completed her final summit of Mount Vinson in Antarctica on 4 January 2019. Mumbai: Arunima Sinha, 30, is the world's first woman amputee to climb Mount Everest. She is also the first Indian amputee to climb the mountain. She was a national-level volleyball player who was pushed out of a running train by thieves in 2011 while resisting them. One of her legs had to be amputated below the knee as a result. She recently completed her final summit of Mount Vinson in Antarctica on 4 January 2019. In 2014, she had already done six peaks: Everest in Asia, Kilimanjaro in Africa, Elbrus in Europe, Kosciuszko in Australia, Aconcagua in Argentina and Carstensz Pyramid (Puncak Jaya) in Indonesia. In conversation with this correspondent, she shares her journey from being a volleyball player to climbing impossibly tall mountains. Correspondent: What were your thoughts after your train accident? Arunima Sinha: Obviously, after the accident, I felt let down. Questions arose: Why me? Why was I the one to suffer? People around me started giving me looks of sympathy which made me feel worse. But then, I pulled myself together and decided to win over the disability. Correspondent: What was your inspiration to scale Mt. Everest and other peaks? Arunima Sinha: I was a volleyball player. After the accident, I played the sport in a wheelchair but never liked it. I wanted to live my life like a queen. I am a sportsperson and I wasn’t happy that everyone was looking at me with pity. I read an article in a newspaper, I was inspired and decided right then that I wanted to climb Mt. Everest. I was inspired a lot by Swami Vivekananda, and cricketer Yuvraj Singh who beat cancer. People called me crazy and that motivated me the most. Mountaineering helps in developing confidence and when I scaled Mt. Everest, I saw many people connecting with me which inspired me to scale all peaks across the globe. Correspondent: How did your family react to your decision? Arunima Sinha: When I first told my family about my mountaineering decision, my mother scolded me and asked me to do a job, like a 10-7 job. I did receive a lot of negative reactions but when I shared my perspective with them, they understood and supported me. My family was the greatest support though they were scared. Correspondent: What were the difficulties you faced during your training and expeditions? Arunima Sinha: We live in a society where people's mentality matters a lot. Mountaineering, which is an adventure sport, is seen for men and not women and especially not for disabled ones. During training, I learnt weight lifting, had to change my artificial leg's requirement and as Indians, we know jugaad. I had to figure out a different way of walking to ease my journey to the top, surviving in mountains, and more importantly, I learnt patience. Mountaineering is more about mental strength to conquer rather than physical. Correspondent: What are your future plans after this success? 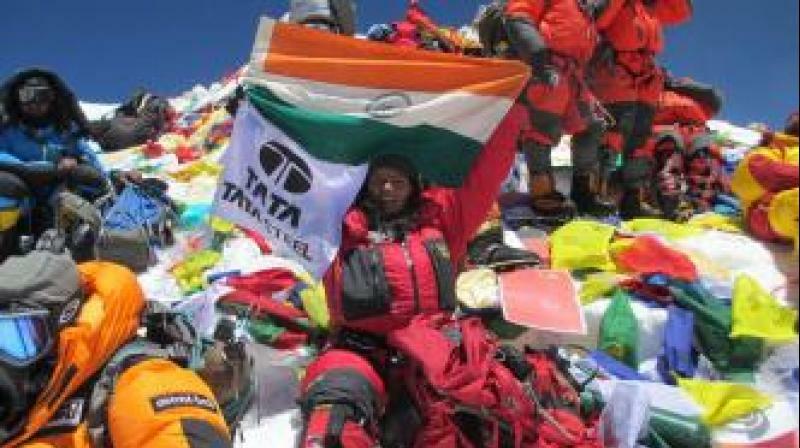 Arunima Sinha: I have already done seven highest peaks. Now, I want to open a sports academy for children, people with disability and help them rise as I did. Correspondent: What is your advice to our youth? Arunima Sinha: To be true, today's generation doesn't have any goal or aim in their lives. If they do, it diminishes in a day or months. There is a struggle to achieve what you want, so go ahead, and get them. Sinha has also written the book 'Born Again on the Mountain', launched by Prime Minister Narendra Modi in December 2014. She was awarded the Padma Shri, the fourth-highest civilian award of India, in 2015. She is the recipient of the Tenzing Norgay Highest Mountaineering Award as well as the Arjuna Award.